Books | Start The Evolution Without Me! I’ve told you about some of the things I do for fun down here. I go to fiestas and processions. I play games with my friends. I watch some TV and a few movies. My buddies and I have pitch-in lunches or go out to eat. I spend a lot of time on the computer. But of all the leisure time activities I do, the one that I do the most is read. One of my greatest fears is that I will be caught somewhere with nothing to read. I keep books and magazines in the bathroom. I never go to any kind of appointment without a book. I keep lots of books on hand. When I moved down here, my books took up more room in my truck than my clothes did. But books in English are expensive and comparatively rare in this part of Mexico and there is a dearth of libraries. And you can only exchange books with your friends for so long before you start getting the same books back. So what’s a voracious reader like myself to do? Well, salvation has come from two particular places in my four years down here. Within a month or so of moving here, a small local hotel set up a book exchange. There was always a wide assortment of paperbacks available, particularly those from snowbirds who, before beginning their journey back to Canada or the US, would drop off all the books they had read during their stay here. There were new books and old books, but primarily paperback novels. Mysteries were very popular and certainly the largest of the genres. But a while ago, that source dried up. Thankfully, I had another source of books, and actually one with a much larger selection. In one of the pueblos on the north side of Lake Chapala, Riberas del Pilar, is a little restaurant called Cafe Magana. 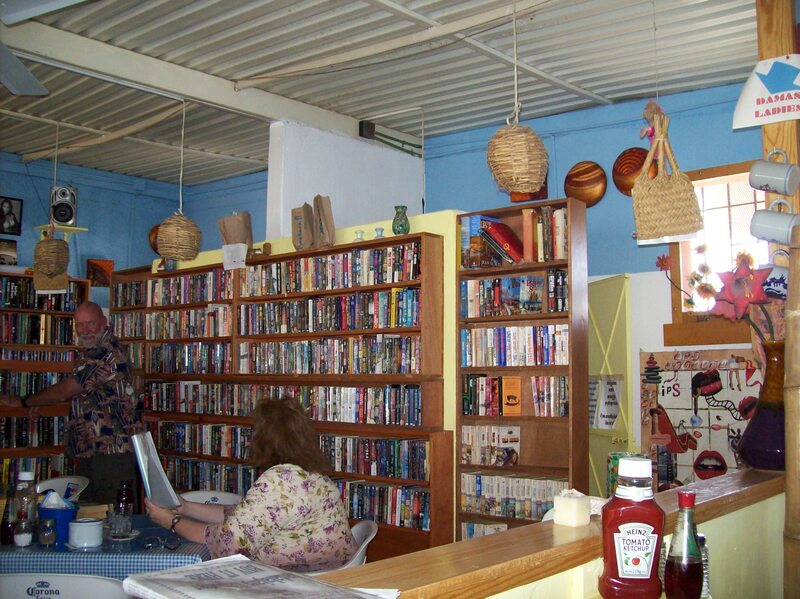 They serve some fine food, but, more importantly to me, they satisfy my hunger for books. It really is primarily a restaurant [note owner and waiter in the background grabbing orders]. And, as you can see in the foreground, they have a DVD exchange as well. But as I said, as much as I might love the food, I go to Cafe Magana for the books. And I have found some fabulous ones there. I just grab things off the shelves and take them home. Sometimes they are very bad and I quit reading them immediately, but sometimes I stumble across some jaw-droppingly good ones. My latest favorites are “The God of the Animals” by Aryn Kyle and “Five Quarters of the Orange” by Joanne Harris. 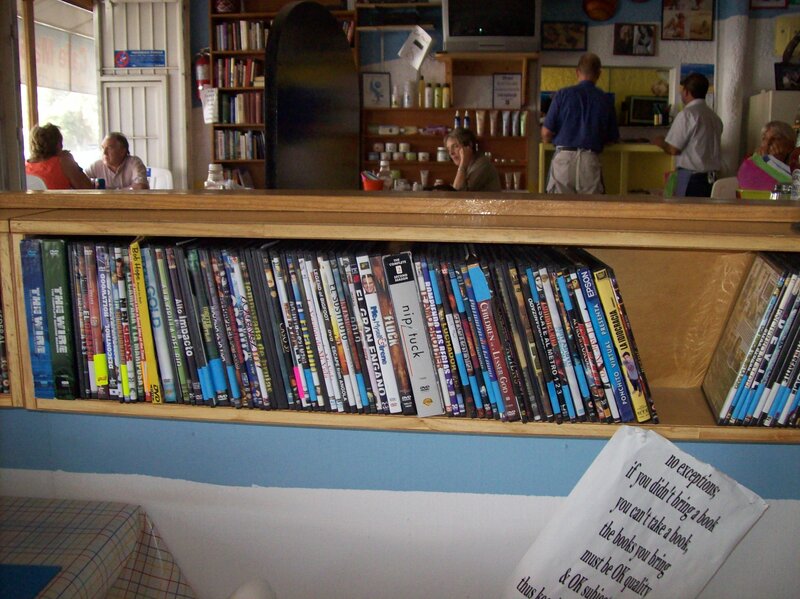 And if it were not for Cafe Magana and their book exchange and great food, I might never have discovered them. So thanks, Cafe Magana! 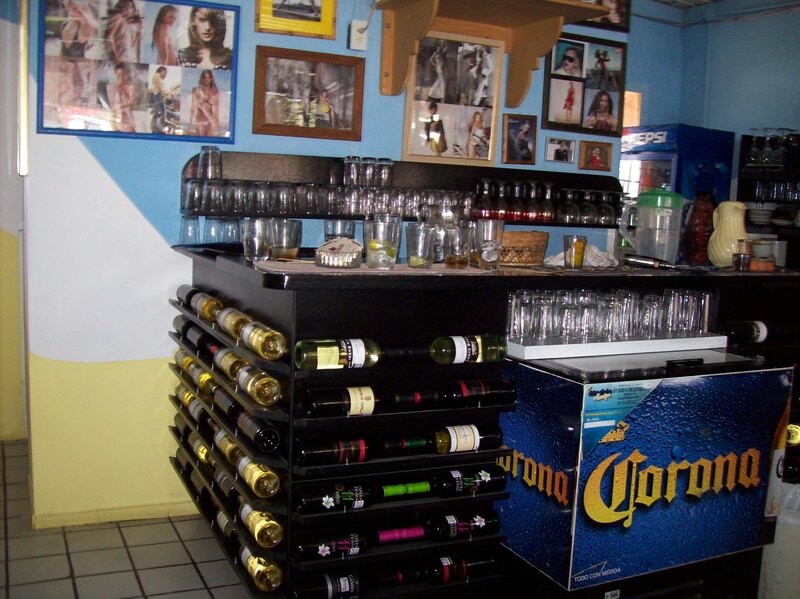 I will be frequenting you! And enjoying your great fish and chips! This entry was posted in Food, Fun Stuff, Lake Chapala and tagged Books, Jalisco, Lake Chapala, Mexico, Paperback. Bookmark the permalink. There is no God of Animals. I’m glad I found this blog. I’ve always dreamed of relocating to another country. It seems very romantic, although, having traveled the world myself, I realize it’s a lot of work, too. Hope you are safe and happy! It is great to know about this book exchange – but what about the library at LCS? From what I have read it is the largest English language library in all of Mexico – ! I have not checked out their selection of books – but it sounds like a good resource ………..